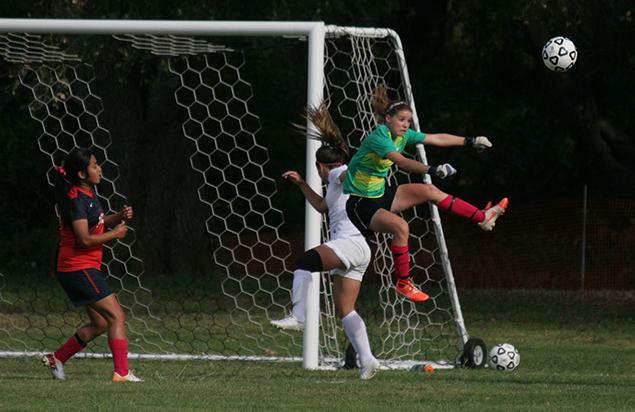 ARC goalie Stephanie Doss leaps to defend her team against Diablo Valley at Friday's game. American River College women’s soccer team broke a four game losing streak on Friday, beating Diablo Valley 1-0. Despite being on the defensive for the majority of the first half, sophomore McCall Madriago was able to score on a goal kick. It was the first goal for Madriago this season, and sealed a much needed victory for the Beavers. The Beaver’s head coach, Paul Arellanes, said he was proud of his team for winning. “It was a much needed win. It was a tough week, we lost our last three games,” Arellanes said. ARC’s goalie Stephanie Doss disagreed with the assessment that the game took place mostly on her end of the field. The win advances ARC to 4-5-2, and was their first win against a fellow Big 8 Conference member. The Beavers will be playing against Sacramento City College on Oct. 14., who currently holds a record of 3-7-1. Be the first to comment on "Women’s Soccer ends losing streak with 1-0 victory"